Also known today as FS route 34, the Granite Springs Road is part of what remains today of “Johnson’s Cutoff,” the first stagecoach route between Placerville and Nevada. The Mt. Democrat joyfully announced on July 11th, 1857 that the first stage had successfully navigated this challenging route over the mountains. Today, we can walk, ride a bike or horse, or even drive vehicles on this section of the old route. What views! 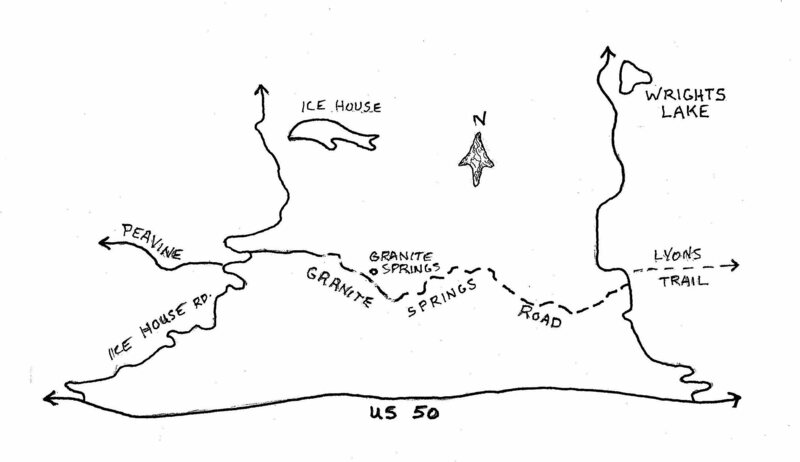 Directions: Go east on Highway 50 for 23 miles and turn Left on Ice House Road, go 6.8 miles and turn Right on Granite Springs Road (signed), marked as FS 34. The road is paved for only 1 mile, then continues as rocky dirt for the remaining 11 miles. The road ends at Wright’s Lake Road just south of the Lyons Creek Trail. This side-trip follows a ridge with Granite Springs 3 ½ miles along up along the Left side, above the road (just past a flat saddle, where an interpretive sign explains the Fred’s Fire). At around 5 ½ miles a grand view opens up looking south across the South Fork of the American River and up the Silver Fork Canyon of the American River. It joins the South Fork near Kyburz.